Last night, I spent an amazing evening over a dinner table laden with exotic Indian food. A bright and beautiful Indian woman, eager to share her abiding love of the cuisine and history of her rich and colorful culture, organized the event, bringing seven of us old girls together to groan with delight over the aromatic spicy dishes filling the beautiful brass bowls. The table bowed beneath the weight of the copious glasses of gin and tonic, mango shakes, and spiced masala chai, and even though we should have been stupefied into silence by the gigantic array of food and drink, we chattered and laughed incessantly between mouthfuls of samosas, papadum, chicken tikka masala, lamb rogan josh, dal, okra, eggplant, saag paneer, naan, raita, paneer kulcha and a host of chutneys of brilliant flavors and colors and heat. Protesting unconvincingly all the while that we couldn’t possibly eat another bite, we also managed to inhale syrupy sweet desserts of rice pudding and gulab jamun and threw back White Russians served in rather large shot glasses, “to aid in digestion,” according to the hospitable food server transplanted to the Mojave Desert from his native shores of Goa. At the end of the night, after rolling myself and my Buddha belly into bed I was visited by cardamom scented dreams of the time I spent in Ceylon. There, in the almost insufferable sticky heat of the “Pearl of the Indian Ocean,” my parents and I, together with a host of international friends, indulged in exotic delicious foods. Provided for us by our talented cook, Lionel, and preceded by their heady wafting aromas, the steaming curries ascended from the basement kitchen to be served at table by the barefoot and sleekly pomaded Number One, Number Two and Number Three Boys, all dressed in dazzling white, crisply pressed lunghis and brass buttoned jackets. The numbers indicated the rigid pecking order of the staff. Number Three was mildly afraid of Number Two, but his anxiety in the presence of Number One was painfully evident in his awkward stance, his own left foot held behind him in his right hand and his opposite thumb planted firmly in his ear. Breakfast was often a serving of Egg Hoppers: fresh eggs baked into the center of bowl-shaped pancakes filled with the 10-alarm leftover curry of the night before. We ate while waving our hands over our open mouths, wiping the sweat from our eyelids and washing the fiery fare down with cold sliced mango. My mother never completely embraced “foreign food” and made sure to have cans of things on hand to create glamorous dinners for her guests. It was in Ceylon that she laid in a pretty hefty supply of tinned “quenelles,” fancy football shaped dumplings that she obsessively added to a variety of things: roasts, fish, chicken and stews. The stash of quenelles was stored side by side with many cases of Piper-Heidsieck champagne, which was indulged in quite often, even in the absence of company. Mom was bit of a food hoarder and paranoid about pilfering. She wore a sterling silver chatelaine around her waist, and her swaying hip jangled a cluster of keys that opened the locked rooms where culinary treasures were stored. Over the next many years, the carefully guarded uneaten quenelles and undrunk champagne crossed a couple of oceans and eventually followed my parents into retirement. The champagne lay locked in the beautiful Chinese inlaid trunk where it aged to thick brown vinegar and the old cans of quenelles, stacked neatly in the stateside pantry, burst one warm day in a deafening and putrid explosion, scaring the pants off of everyone within earshot. 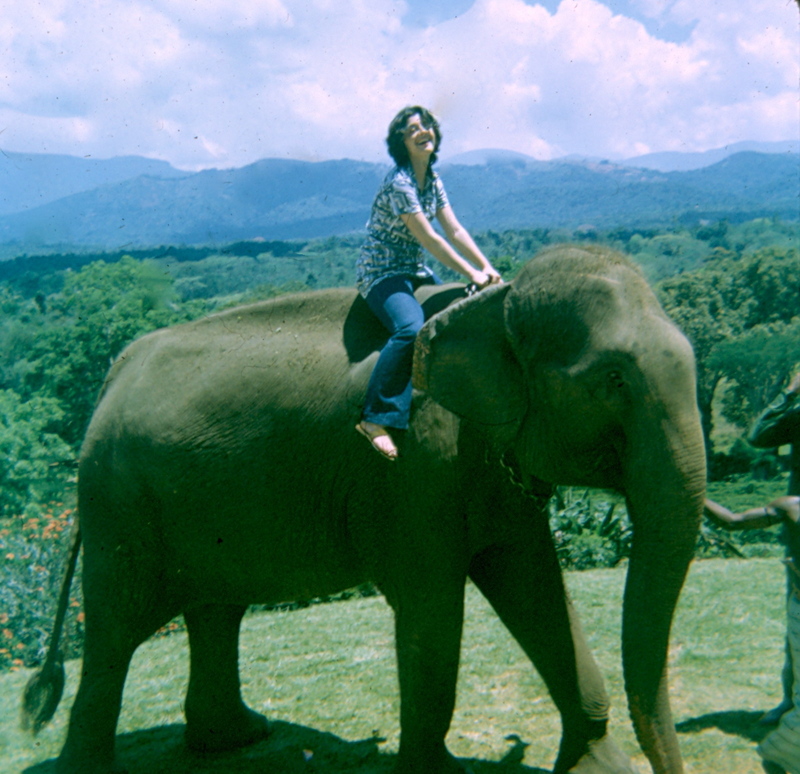 Encouraged by the happy chatter and exotic meal shared by the matrons at the friendly table last night, the joyful young miss on the elephant, remembering long ago Ceylon with great fondness, made a brief appearance. It’s so good to know that Laughing Elephant Girl is still with me. Susan, This is truly a wonderous piece of writing. I hope it is at least a bit as joyful to write as it is to read. Thank you for sharing such meaningful moments in your life. Susan, you took me with you in your words. We have several Indian restaurants locally, and yet I hate to go alone. Next time you’re over this way, let’s dine together. Dear Susan, I always love reading your wonderfully written memoirs! What a life you have had (so far) and you have a fabulous writing style. You are a true artist in every way. I love your photos also, getting a glimpse of you as a girl!